2,000 people have subscribed to the Dublin Bikes Scheme which was launched in the city today. Hundreds of bicycles are available for use on the streets of Dublin under the scheme. Around 1,000 journeys were made on the bikes in the first six hours of use. Dublin City Manager John Tierney and Councillor Andrew Montague, representing the city's Lord Mayor, led a group of about 150 cyclists on their first journey on the new bicycles. The initiative has been organised by Dublin City Council in conjunction with a French advertising giant who will fund the operation in return for advertising space. 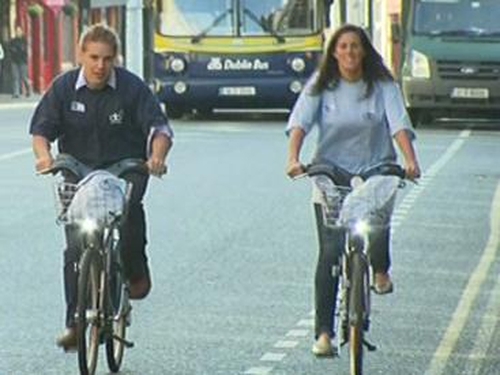 The 450 silver unisex bicycles are available for use by the public at 40 locations from the Mater Hospital in the north of the city to Grand Canal Street in the south. A short journey lasting a half an hour is free but six hours costs €4.50 and its €2 for every half hour after that. Would be cyclists also need to leave €150 deposit using either a credit card or a bank draft, which will be used if the bike is not returned. In a separate event, around 100 cyclists converged in Irishtown after travelling 10 kilometres from three different locations across the city. The cyclists set off at 11am from Kilmainham, Bull Island and Dun Laoghaire.